Périgueux, capital city of the Dordogne department, with her past dating back to Roman times. Staying at a campsite in Perigueux, is a genuine dive into history. To start your journey back properly, go to the Vesunna Gallo-Roman Museum: it keeps many traces of the Romans presence. The site created a link with our modern period since it was conceived by famous architect Jean Nouvel, the most famous French architect of our times, designer of some of the boldest buildings in the world. His main goal was to plunge visitors in the past while at the same time highlighting the precious ruins held by the museum. Keep on walking on memory lane thanks to your vacation at a campsite in Perigueux with the Middle Ages now. This period's remains are still very much present in the city thanks to the numerous medieval houses. Its most beautiful incarnation though, comes with Saint-Front Cathedral. This major stage on the way to Santiago de Compostela was built on a hill. Its Byzantine influences will probably stir your curiosity. Do not get fooled by its 5 domes though: you're still vacationing at a campsite of Perigueux, not Constantinople! Time to remind the Renaissance period now. It is still visible in the city's elegant mansions. The nineteenth century finally traced its wide avenues in the Belle Epoque style. That's it, you completed your travel back in time. You can now return to your campsite in Périgueux! Along the River Valley of the Isle, many sites allow you to visit the city. All of them offer quality amenities and comfortable accommodations. 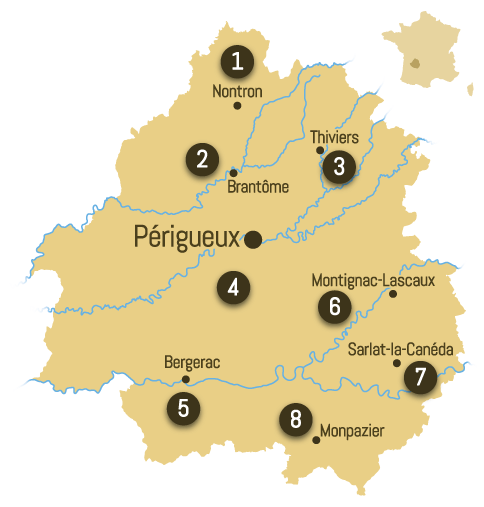 They are an invitation to discover Perigueux, its surroundings and closeby countryside. Villages and towns dot the riverbanks. “Gabarres” (local barge-type ships) offer you a lovely trip on the water. Besides Périgueux, this region of the Dordogne allows you also to visit Brantôme, the Vézère Valley or Bergerac… Thanks to your campsite in Périgueux, you can even get to Bordeaux which is only 40 minutes away.